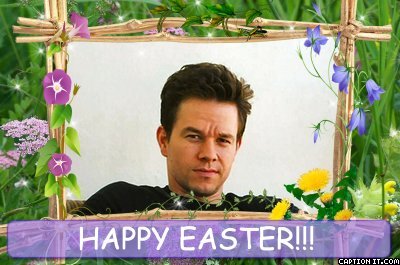 MarkWahlberg.com :: View topic - HAPPY EASTER!!!! Posted: Sun Apr 12, 2009 5:10 pm Post subject: HAPPY EASTER!!!! May 10th is Mother's Day!!!! Mark: Woo hoo!! My Birthday is almost here!!! I want presents, cake, ice cream, balloons, & a donkey. U mean, He cant have no presents, cake, ice cream, & balloons. But, I think I know what HE WOULD WANT. He'd want, just the love and happiness of his family and friends, together, forever. Nothing more, nothing less. Aww, that's so sweet. I want to see Mark Wahlberg.